Can I get heated seats? Do I have to get a sunroof? Find out what you need to know about Tesla features right here. Removable roof section (fabric)Spans width of car, providing much of the effect of a convertible. Dampers, manually adjustableSuspension dampers whose firmness can be manually adjusted. Far more difficult than hitting a button, but makes it possible to fine tune. Suspension dampers whose firmness can be manually adjusted. Far more difficult than hitting a button, but makes it possible to fine tune. Manual steeringNo power assist for the steering. Rare. No power assist for the steering. Rare. 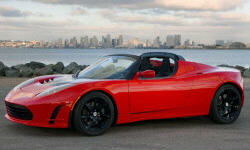 None of our members have yet commented on the available features of the 2011 Tesla .